Morton’s Toe goes by many names. It is called Greek foot, Royal toe, Morton’s syndrome, and long toe, just to name a few. It is a disorder that affects the front of the foot. It is characterized by the second toe of the foot being longer than the big toe. If you are suffering from Morton’s Toe, it is likely that you commonly experience pain or discomfort in the ball of your foot. This is caused by the constant pressure that is exerted on the second toe because it is longer than the big toe. In addition to pain and discomfort, you may also develop calluses under the head of the second toe. Fortunately, wearing the right shoes can help prevent some of the pain. 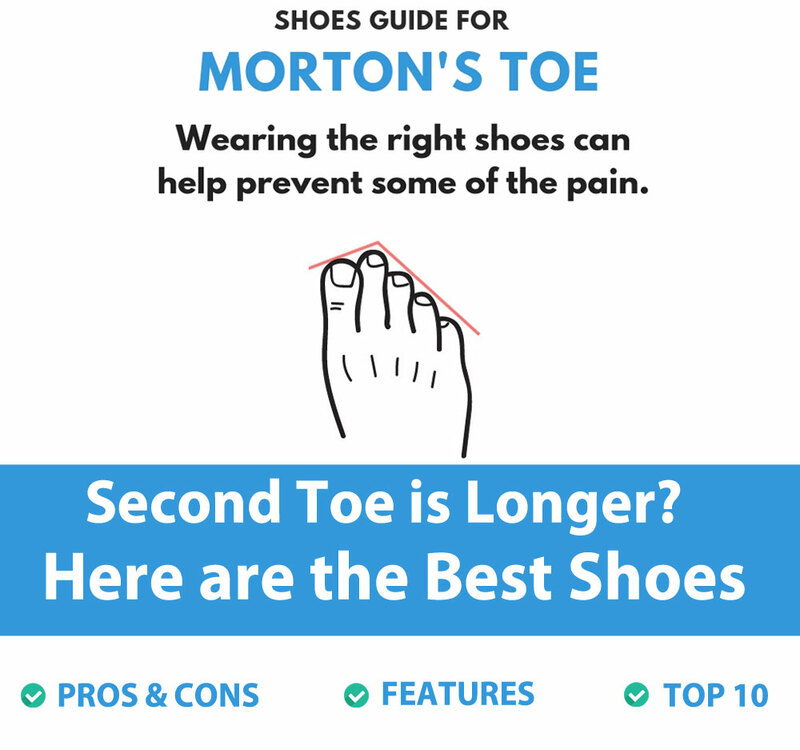 This article will review several options to help direct you to the best shoe to alleviate the pain from your Morton’s Toe. The Men’s MW928V3 by New Balance has two different features that allow it to provide comfort. It features ROLLBAR technology that stabilizes your foot for extra support while walking as well as ABZORB cushioning in the midfoot area for improved comfort. The one downside of these shoes, unfortunately, is that all of the extra cushioning and stabilization features leave them rather heavy. Another benefit of the shoe is its wide design. Not only does the MW928 come in “Wide” sizes, but it is also designed with more toe room than some other New Balance shoes. There is one downside to this shoe. Sometimes, it seems as though there is excessive wear and tear and damage after a few weeks of walking. Fortunately, this can easily be remedied by purchasing from a qualified manufacturer of New Balance shoes. Verdict: When these shoes are purchased from a qualified manufacturer, they are excellent. The additional toe room combined with the padding allows them to provide you a comfortable walking experience. The Skyscape Fuse walking shoes work well for people suffering from Morton’s syndrome because of the unique, stretchy, soft, foam-like material that makes up the upper part of the shoe. This feature, paired with the snug laces, allows the shoe to hold snugly the outer parts of your foot for a comfortable fit that reduces slippage and discomfort. Another reason that these shoes are ideal is that they have a flat sole that distributes more of the weight toward the heel, rather than the toes. The one downside of this design is that it does not provide a lot of arch support. Verdict: If you have a normal to high arch, then this shoe works incredibly well for relieving the pain. Unfortunately, the lightweight and comfortable design is not suited well for people with flat feet. Have you ever dreamed of owning a shoe that fit perfectly on your foot, despite your Morton’s Syndrome? The Cohesion 9 running shoes by Saucony feature a unique design that seems as if it were tailored to fit your foot. In addition to its unique shape, the shoe features Flex Grooves for decreased impact when running and a Heel GRID system that creates a responsive, yet stable home for your foot. The one major downside to this shoe is that it does not seem to be true to its size. To get a truly perfect fit for your foot, it would be best to buy these shoes somewhere you can try them on before you buy them. Verdict: These shoes have a slight sizing issue, but this can easily be overlooked when you find the right ones to fit your feet. They hug your foot perfectly and significantly reduce impact when you are running. This shoe by ASICS is very comfortable because of its thick sole that is about 1.5 inches in height and its forefoot and rear foot cushioning systems. In addition to the comfort, it features a stretchy design that offers a glove-like fit. The GEL-Kayano 21 also has incredible arch support. The disadvantage of this shoe is that it does not offer heel stabilization. However, for the comfort that it provides, some people may be able to overlook this small flaw. Verdict: If you can overlook the lack of heel stabilization, this is an excellent shoe choice in terms of comfort. It will alleviate some of the pain that you must deal with when living with Morton’s Syndrome. This dress shoe is one that should be worn on occasion because it is not durable enough to hold up against everyday wear. When you do need to dress up, however, you will find that these shoes are classy and comfortable. The outsole is great because it has dual density EVA material that reduces the impact felt in the leg and foot. Additionally, this shoe features adiPrene cushioning and a sponge EVA insole that will remember your foot for a customized fit. One more thing to mention is that these shoes tend to run small. Verdict: These shoes are not quite as durable as you would prefer, but they work well for occasional wear. The insole and outsole are also incredibly comfortable. It is a shame that the shoes are not more durable. This slip-on dress shoe is comfortable enough and durable enough to be worn as a regular dress shoe, even in a workplace setting. One of the benefits that improves the pain is the good arch support, which takes some of the pressure off the ball of the feet. The toe of the shoe also has a nice shape. It does not cramp the toes, which is especially important. The one major downside of this shoe is that it is too small for most custom inserts. You may find that there is not enough room for your foot after placing an orthotic inside of your shoe. Verdict: As long as you do not need to wear orthotic inserts, this shoe is an excellent choice. It is designed for dress wear but is more comfortable than most other dress shoes. There are quite a few features of this shoe that make it the ideal hiking shoe. First, it features a thick sole that grips well, even when you are walking across slippery surfaces. This reduces slippage and sudden movements that may cause pain. It also has a deep heel area that steadies the foot and distributes the weight of your body toward the rear of your heel. The arch support of the shoe further distributes your weight. Finally, there is plenty of room for orthotic inserts if you have them or need them. The drawback of this particular shoe is that there are some problems with workmanship in some of the shoes. With regular use, they may only last 6 months to a year before you need to replace them. Verdict: Depending on how much you are willing to spend for a quality pair of shoes, these may not be worth it in the long run. Though they are incredibly comfortable, the workmanship is sometimes lacking and that is a significant disadvantage. Otherwise, they are an excellent shoe for relieving the discomfort. This pair of shoes has a few advantages for people who struggle with Morton’s Syndrome. First, they have Stealth Rubber soles that grip almost anything to reduce the chance of slippage and injury. They also feature a unique external heel cage. This goes around the backside of the shoe to increase stability and support. It also allows you to distribute your weight toward your heel, rather than the sole of your foot. Finally, the insoles of the shoe can easily be removed and replaced with insoles for additional comfort or even taken out completely for a little extra room. There is one major downfall to this pair of shoes. They become very heavy when they are wet. Verdict: As long as you are not taking a wet trail, these shoes are an excellent choice for hiking. They reduce the stress on the ball of your foot and offer good support. The Vibram Men’s El-x shoes are designed so that there is an individual pocket for each toe, rather than a single pocket where all toes sit. This is beneficial because the toe pockets are long and will even fit your second toe well. This also gives additional support to your foot. One consideration to make before purchasing this shoe is whether or not your foot will adapt well to a minimalist design. These shoes have a thin insole and are very lightweight. If walking barefoot helps your Morton’s toe, then these are an excellent choice. If you need additional padding, however, you may want to choose a different shoe. Verdict: A minimalist design works well for some people suffering from Morton’s Syndrome, but not for others. Consider how well barefoot works for you before choosing this shoe. Otherwise, the unique toe design helps to support the foot and reduce pain. The unique design of the Vibram KSO EVO-W is the reason that the shoe is so great for people suffering from Morton’s syndrome. Rather than having a toe pocket that is a large area for all toes, these shoes have individual toe pockets for each toe. This is advantageous because the pockets are rather long, making them perfect for someone with a longer second toe. The one major downside is that these shoes distribute the weight to the ball of the foot instead of the heel. This can be problematic for someone with Morton’s syndrome, especially if the pain is concentrated in the ball of your foot. Verdict: The fit of this shoe is very unique. This makes it an excellent choice for some people while others who suffer from Morton’s Syndrome will not find relief in this shoe. Make sure that there is a return policy just in case the shoes are not the right choice for you. Whether you have kids that you chase around, work a 9-5 job, or just want to get out and be active, you should not have to suffer from the pain of Morton’s Toe. What is the final verdict? Here are the top shoes for men and women. This is the best shoe for men because they comfortably hug your foot and offer reduced impact whether you are walking or running. The slight size problem can easily be overlooked when you consider the level of comfort and quality that these shoes offer. This is the best shoe for women because of the unique design that offers heel stabilization and distributes weight away from the front of the foot. As long as you are not taking it on wet treks (where it will become very heavy), this is an excellent shoe for any purpose. What your choice comes down to is how much you value your comfort. Remember that Morton’s syndrome often leaves you with a unique foot shape and your individual needs for comfort. Try out these shoes or similar ones until you find the perfect fit for you.